← Las Palmas — Excelente Cubano! Continuing our Valentine’s week of restaurant sampling, we drove down to Jensen Beach via the beach (this is 8-lane Florida, we don’t do 8-lanes any more if we can avoid them). It was worth it. 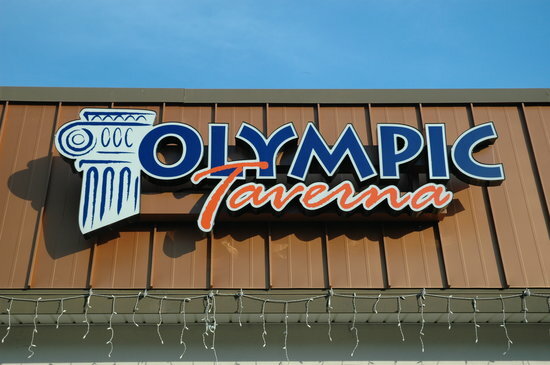 Olympic Taverna is one of three sibling restaurants in the Jensen Beach area. This one appears to have occupied the property of some food dispensary that had a drive-thru. The place is clean. The decor is modest. The service is crisp. The servings are huge. The food is better than our former favorite in Alexandria, VA (the top Greek place in the DC area for years). We had Loukaniko (sausage with orange zest and pita), salad (very fresh greens), Avgolemono soup (without diced chicken), Pastitsio (think tomato-less lasagne made with macaroni and bechamel), Mousaka (eggplant and bechamel), and Spanikopita (spinach phyllo pie) with lemon roasted potato slices and Greek green beans. And Baklava, the largest slice we have ever had in a restaurant. As we said, Opa! We took home enough food for a lunch and a dinner. The only thing we didn’t care for was the green beans. They had been stewed in a tomato and onion sauce to overdone. We would have preferred al dente with some lemon juice and herbs. Really a tiny thing when the rest of the meal was considered. This entry was posted in 2014 and tagged Food/Drink. Bookmark the permalink.